It was recently announced that plans are moving forward to build a new home for one of Evansville’s most beloved landmarks. 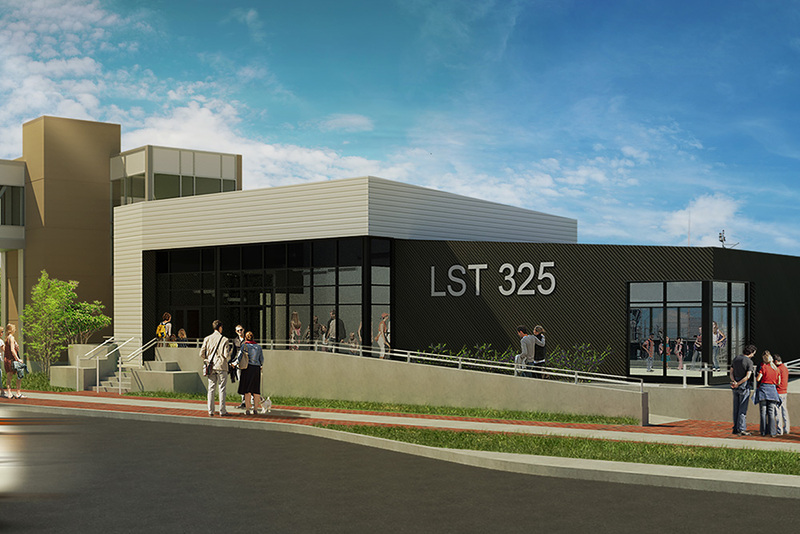 About a year from now, in the former location of Evansville’s riverboat casino, the USS LST 325 will dock into a newly designed access system and pedestrians will be able to enjoy a roughly 3,000 square foot visitors center — both designed by Morley. In fact, Morley provided land surveying, site design, and building design for this project as well as coordinated with the Levee and Army Corp of Engineers. The new Mooring system will allow the LST to move with the river without redocking, just as the river boat used to. The new access system will accommodate year-round vehicle access to the deck of the LST, which means easier access for maintenance vehicles and shuttles for guests when necessary. We will also be making the main deck of the LST ADA accessible, which was historically not possible, by modifying the existing personnel ramp. The 2,900 sq. ft. Visitor’s Center will be both accessible via the Greenway as well as through the existing LeMerigot bridge tower. It will include a new exhibit area, a tour meeting area, gift shop, kids’ interactive zone, offices, public restrooms, and an outdoor watering station for walkers and their dogs! It’s an honor to work on a project this impactful to the Evansville Community, and Morley will periodically update this page as new information about the LST move becomes available.